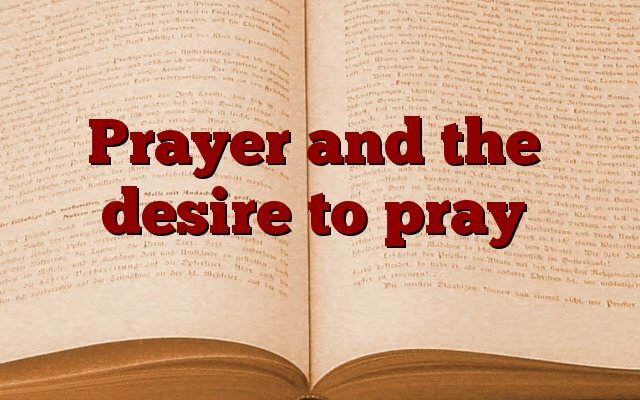 Which comes (or should come) first in the Christian’s life: prayer, or the desire to pray? When I think about my own prayer life, I’m often ashamed. I don’t often pray as I feel I ought. And when I do, it’s often short-lived. I call out to God briefly out of desperation, realizing my need for Him to direct my life, but then it gradually drifts back toward the mundane requests that typically define my communication with God. I want to feel a sense of desperation for God all of the time. It gives me passion as I pray. It drives me to pray more often. It makes prayer an urgent thing. But just because I want and maybe should have that sense of desperation as I pray, it doesn’t necessarily mean that I should wait until I have that feeling before praying. On the one hand, prayer without first having the desire to pray feels like legalism. It feels like I’m only praying because I think that I should. Is that how God wants me to come to Him? Out of obligation? Out of duty? No, God wants me to come because I love Him and need Him! He wants me to see how good and beautiful He is, and to call out to Him because I love to respond to His invitation to speak with Him. On the other hand, waiting for that sense of desperation all the time before praying seems to treat God like a Get Out of Jail Free card. But maybe that’s not such a bad thing. After all, we can add nothing to God. The message of the gospel is that we’re weak, but that Christ rescues us out of our sin if we trust in Him. Shouldn’t prayer also reflect our weakness and God’s strength? When it comes down to it, I’m not sure a person can pray without having at least some desire to pray. Even if it’s slight, the very fact that I bow my head and begin to speak with God indicates a desire to do so. Maybe it’s not out of desperation, but at least it’s something. But what about the issue with legalism? I guess another way to look at it would be to see it as faithfulness. After all, we often don’t feel like doing the right things, but if we want to be pleasing to God, then we’ll do them anyway. And as we do those things, we’ll find more joy in them and we’ll begin to desire to do them because we see how God’s plan is actually better for us as well. Prayer is much the same. Sometimes, we’ll be desperate for God and we’ll cry out to Him in our need. But even when that feeling isn’t present, we ought still to pray. And as we do so, God will change our desires so that we find more and more joy in talking with our Savior and Lord. Previous Previous post: The word of the cross = the power of God. Next Next post: Should church be fun?